Bizcorps is a strategy advisory firm specializing in high-potential, growth-oriented businesses in emerging markets. They shared career opportunities with our students on-campus last month. 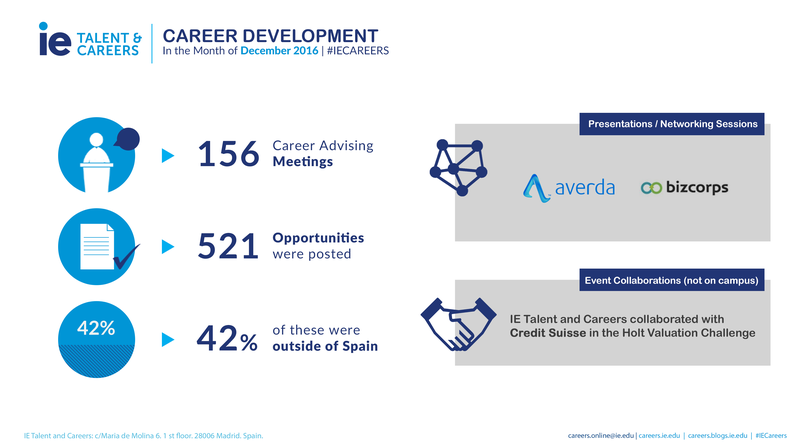 The following is a summary of IE Talent and Careers‘ career development activities with companies and students during the month of December. As a result, the department is able to provide on-going, top quality service to students across all IE programs. Check the Career Portal and stay up to date with the latest job offers, company presentations and networking events. Ana is Career Services Engagement Manager at IE Talent and Careers and current content curator and producer for the IE Careers Blog. She designs and runs engagement tactics for IE students on-campus and recruiters worldwide. Passionate about the Digital world, this Venezuelan engineer and IE Master in Management graduate previously worked in the online advertisement and marketing departments of Sony Pictures Television, BMW, TheObjective.com and Metafisica.com.